Israeli bomber Ran Nakash let his artillery fly at the South Philly Arena Wednesday night, but Victor Barragan of Oxnard, CA proved just too tough to be knocked out. In fact, he provided his share of uncomfortable moments for the rising Nakash, who looked pretty ordinary on this night. Both boxers landed their shots, but Nakash came out comfortably on top. One judge scored it close at 96-94, but the other two had it 97-93 & 99-91. The win pushed Ran's record to 25-0 with 18 KOs. It was the second time Nakash went a full ten rounds, and the seventh time overall that he failed to score a knockout. I've seen him huff and puff his way to the final bell before, when he couldn't sustain his steam-rolling attack. But Barragan was not just an opponent who escaped by merely hanging in there. No. He was an active participant, and gave Nakash his toughest test so far. Nakash did more than enough to win, but it was interesting to see him in a real fight. Barragan was a rather late substitute for former light-heavy champ Lou Del Valle. After taking the uneventful first round, Nakash was wobbled once late in the second. But it was in this round that he began landing a sneaky and effective left hook. The punch became his key weapon, landing it both to the head and body. The hook found its target with a loud whack in round three, and for a moment, it appeared that Ran might be on his way to a KO. But Barragan fought back, unfazed. Nakash was also warned twice by referee Benji Esteves for hitting low in the round, but he never got into trouble again. Barragan won his sole round on my scorecard in the fourth, when he easily and consistently landed his shots. In the fifth, Barragan seemed to hurt Nakash to the body. At 204.5 pounds, Nakash's middle looked a little soft, so the belly was a smart target. When Barragan went there, he got a reaction. However, he didn't do enough downstairs to make anything happen. It was interesting to see Nakash finally acknowledged as a heavyweight, as calling him a cruiserweight has been a three year white lie. In his 11 visits to Philadelphia, he's only made the cruiserweight limit once (by half a pound), and has scaled as high as 211. The sixth was a another round when Barragan landed a lot of punches, but not as much as Ran. The rest of the fight belonged to Nakash, but it wasn't scintillating. 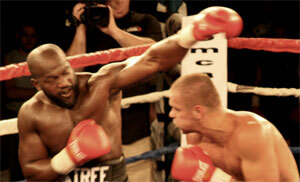 He did land a rocket of a right hand to end the eighth round, but the rest of it was pretty run of the mill. In the end it was another win for Nakash, this one against a tough worker who slipped to 11-6 with 3 KOs after the fight. Judge Alan Rubenstein scored it 96-94, probably giving Barragan credit in the rounds mentioned above where he had marginal success. George Hill had it 97-93, and Bernard Bruni saw it 99-91. I agreed with Bruni. The small crowd seemed to be there for Nakash. They cheered him on and waved their flags of Israel throughout the bout. Nakash moves on with a great-looking 25-0 slate and seems to be poised for a bigger fight. With that pile of wins to his credit, there is no doubt he'll move on to some opportunity before long. In fact, there is serious talk that he'll take on Bobby Gunn in September. In his most recent outing, Gunn faced cruiserweight champion Tomasz Adamek last July, but was stopped in the fourth round. So perhaps that would be a good test for Ran. 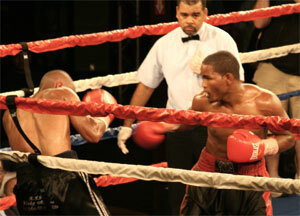 In the semi-windup, welter-weight Felix Diaz of the Dominican Republic started fast against Broderick Antoine, Troy, NY. He landed a hard shot in round one that almost ended the fight. But after that the fight settled into a dull affair. Diaz ran the table except for round three when Antoine held a slight advantage. In the fifth, Antoine suffered a cut over his right eye, and it eventually ended the fight. 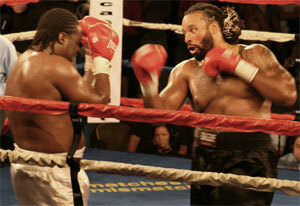 The bout was stopped in the eighth and final round, when referee Shawn Clark called in the doctor just 35 seconds in. The fight was halted, giving Diaz his sixth straight win without a loss. It was his fourth stoppage. Antoine fell below .500 to 10-11-1 with 5 KOs. In what figured to be the best fight of the night, Salem, NJ's Mark "Oak Tree" Brown failed to even give Ukrainian heavyweight prospect Vyacheslav Glazkov a fight. The usually entertaining Oak Tree looked like he was on a death march in this one. It started backstage when the always outspoken and charged up Brown seemed oddly low key. It made me wonder if he even wanted to be there. He entered the ring not with the charismatic cartoon persona fans are used to. Instead he looked more like someone trudging into the dentist office, anxious to just get it over with. Glazkov helped him out with that. Instead of their scheduled six rounds, Glazkov won the two opening rounds and finished Brown at 2:41 of the third. Brown stayed on his feet, but received enough punishment to prompt Benji Esteves to stop it. It was Brown's third straight loss and left him 15-4 with 7 KOs. Glazkov improved to 6-0 with 4 KOs. Russian super middleweight Maks Limonov used a peppy crowd-pleasing style to take a six round decision over Julius Fogle of North Carolina. Fogle showed a good jab but Limonov was more aggressive. The second was very competitive with both guys firing away. Fogle began a rally in the third by hurting Limonov several times. The attack slowed Limonov's peppiness, but he remained in the fight. Fogle took the fourth round to even the fight, but had to recover from a low blow in the process. 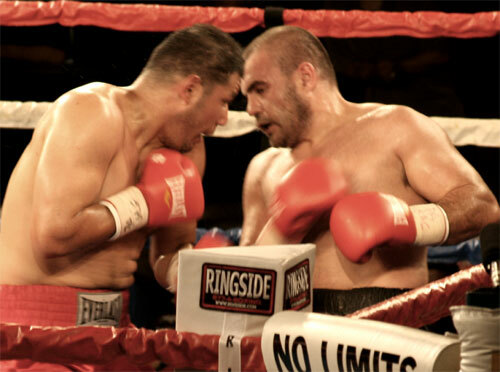 The final two rounds belonged to Limonov except for a one big right hand by Fogle in round five. The punch rocked the Russian, but he fought on and won the fight. Judge Bernard Bruni voted for Fogle 58-56. But George Hill and Alan Rubenstein scored it 59-55 for Limonov. My score read 58-56 for Limonov. Former Penn State Offensive Lineman Imani Bell successfully traded football for boxing in his professional ring debut with a TKO over Lee Thomas of Saginaw, MI. Bell showed some signs of a weak chin in the opening session. His legs were rubberized by one right hand, and moments later another one dropped him to the floor. What must he have been thinking about becoming a boxer while climbing off the floor? But rise he did, and went on to inflict enough of his own punishment in round two to convince Thomas to quit on his stool before the bell for round three. The result went in the books as a TKO2. It was the fourth straight loss for Thomas, now 1-4. Philadelphia's Bell moves on with a shiny new 1-0, 1 KO record. 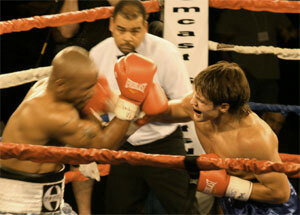 The night opened with a four round lightweight bout between Israel's Oz Goldenberg and Marcos Garcia of Camden, NJ. 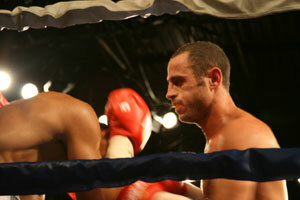 The competitive fight ended in a majority decision for Goldenberg. The evening ended with a four round super flyweight fight won by Alejandro Solorio of Huntington Park, CA. He beat Russian Rustam Nabeev by unanimous decision, scoring the only upset of the night. Solorio raised his record to 4-2 with 3 KOs. Nabeev lost for the first time, 5-1. The show was the inaugural offering from No Limits Promotions, a cartel of international wallets, headed by promoter Don Elbaum, who apparently provides the boxing brains for the group. Joey Eye Promotions was also associated with the night's promotion. The card was taped by the Comcast Network for a delayed broadcast. The announcer was Larry Tournambe. The alternating referees were Shawn Clark and Benji Esteves. Alan Rubenstein, George Hill and Bernard Bruni judged all seven fights. 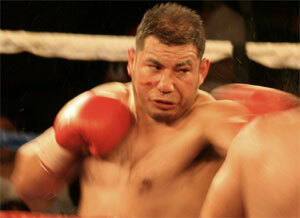 A paltry crowd of about 300 came out to the Arena for a rare Wednesday night of boxing.